The Emperor Penguin is the tallest and heaviest of all living penguin types and can be discovered in Antarctica. 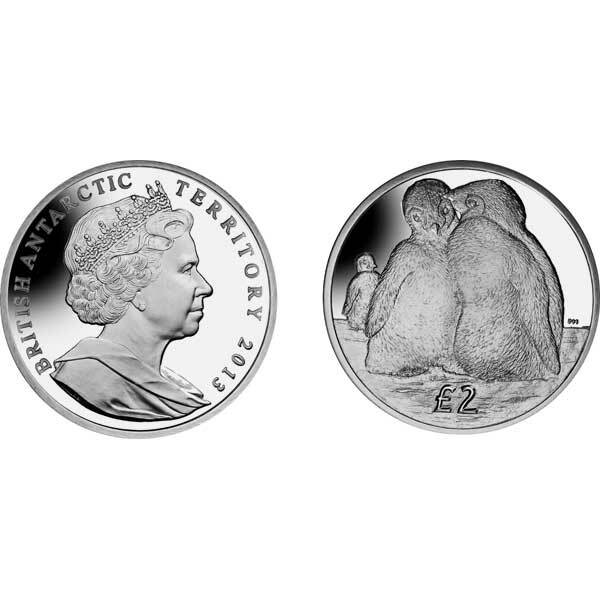 It is therefore apt that this new coin featuring 2 lovable penguin chicks is being issued in support of British Antarctic Territory, particularly as the Emperor Penguin represents the Antarctic on the main Coat of Arms of the Territory. The Emperor Penguin is perhaps most understood for the journeys the grownups make every year at the beginning of the Antarctic Winter when all mature Emperor Penguins travel to their nesting locations, commonly walking up to 75 miles inland from the edge of the pack ice. The temperature can often be as low as -40°C. The female penguin lays one egg in May or very early June. After laying that single egg, the mom's food reserves are fatigued and she has to transfer the egg very carefully to the father, it is rolled onto the male’s feet to ensure that it is incubated and kept cozy by a fold of skin that hangs from the stomach of the male. If the egg is dropped, the chick inside could not survive the cold temperature levels of the icy ground. During this incubation and even after the egg has hatched (which could be around 115 days), the fathers gather together in a huddle-- this is the only way they can survive the chill and winds of approximately 120 miles per hour. The female penguin returns a few days after hatching and locates her spouse amongst the hundreds of fathers by his call and she then takes over caring for the chick. The males can then leave to take their turn at sea to feed, returning some 25 days later. 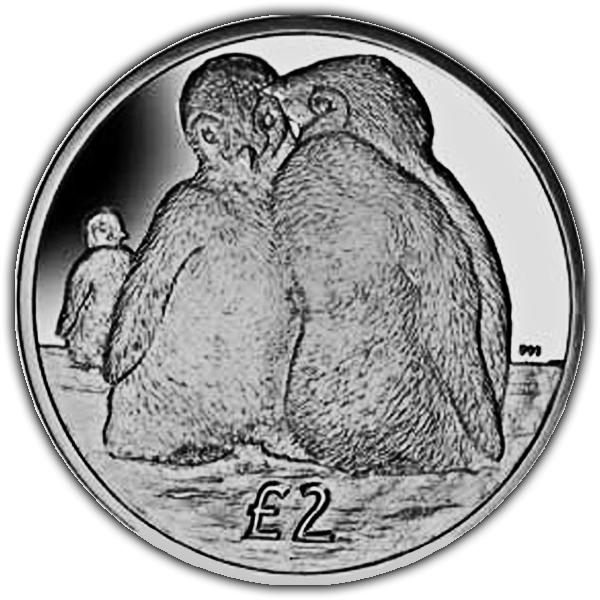 The design on the coin features two delightful Penguin chicks gathered with each other on the ice while the obverse of the coin carries an effigy of Her Majesty Queen Elizabeth II by Ian Rank-Broadley FRBS. 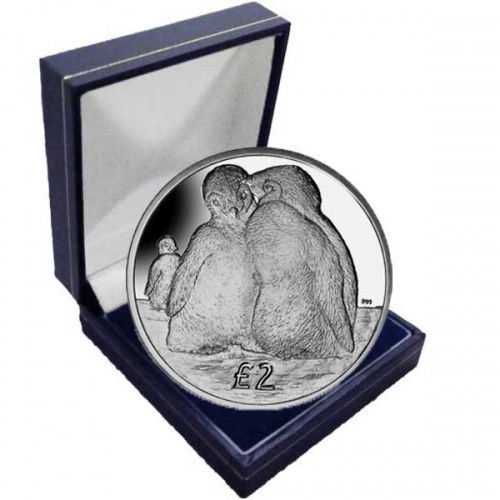 Available in Cupro Nickel and Proof Sterling Silver, each coin is outlined to excellence with the silver variations struck 4 times to attain the 'proof' finish.